I have been quiet over the last few weeks I know, this is because I have been coming up with a master plan. You see, I get so obsessed with losing weight, only ever seeing the numbers, that I get so stressed I can't think of anything else. And what does stress do? It prevents you from losing weight. Not losing weight despite my efforts has been stressing me out even more, so it's a vicious circle, and I needed a plan, and I think I might just have one. Back in August last year I toyed with the idea of a 70.3 triathlon this summer, I think I even wrote a blog about it, but decided it wasn't for me at the time. If I did it, I wanted to do it properly, I didn't want another performance like London Marathon. So I will do it properly, next year, and I have a plan to get me there. I'm lucky that I have so much support from friends, family, Oli and through Twitter, and my best friend will be completing an Ironman this summer, so I don't have to look far get help and advice on training. The 70.3 will be next year, so this year is where I will be getting ready for it. During the last 9 months I've worked hard to get a good base for training, although my core strength isn't brilliant it has vastly improved, and it is something that I want to concentration on to base my training around in the gym. I really am starting from the beginning with this, I'm not a great swimmer and I don't own a bike (having not ridden one since I was 12) but hey, at least I can run. Tuesday saw my first swimming session with Rachel. Rachel is a good friend and sports coach who I met through Regency Runners and was also my mentor during training for London Marathon, after I told her what I was planning she instantly offered a swim session. I was a little nervous beforehand as I'm not comfortable in water. When I was two I had Meningitis and lost my hearing, so through my early years had countless operations to correct this, it affected my balance and for a long time I wasn't aloud to get water in my ears. When I was given the all clear I had a few close calls in school swimming lessons and I lost all confidence, so this is why I swim off of Nans, a member of the dry hair brigade! Rachel was a little dubious when I told her all this, but after seeing what I could do during the session she has confidence that I will pick it up quickly, apparently I have a very good leg kick for crawl so that's something to be pleased about! I enjoyed the session, and was pleased with what I achieved. It may seem silly to some but learning how to put my head in the water and breathe out was a massive breakthrough, now I just need to learn to control the breathing as I'm swimming. Rachel has given me some drills to practise so I plan to swim twice a week, as I have an event that I am hoping to enter in May. 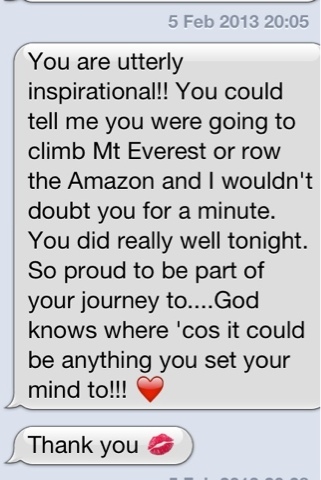 I also received a great message from Rachel after the session, showing her belief in me. This really meant a lot as I look up to Rachel, and as a sports coach, she really knows her stuff! So, I have a plan, now to break the news to Oli tomorrow! I'm a fatty trying to get to be a thinny! Who’s Stupid Idea Was This Anyway? Yep, I'll sign up! Just don't make me say no!